Nonetheless, the poll not surprisingly raised many more questions. Questions that we plan to pose and explore online over the next several weeks at bostonglobe.com/tsarnaevforum. We hope you will join the conversation there. 90% responded yes or probably. Given media reports, any doubt in Tsarnaev’s guilt may be head-scratching. But that actually suggests a healthy belief in the American justice system — the idea that a defendant ought to be considered innocent until proven guilty beyond a reasonable doubt. Those who say they’re completely certain Tsarnaev is innocent? That is harder to explain . 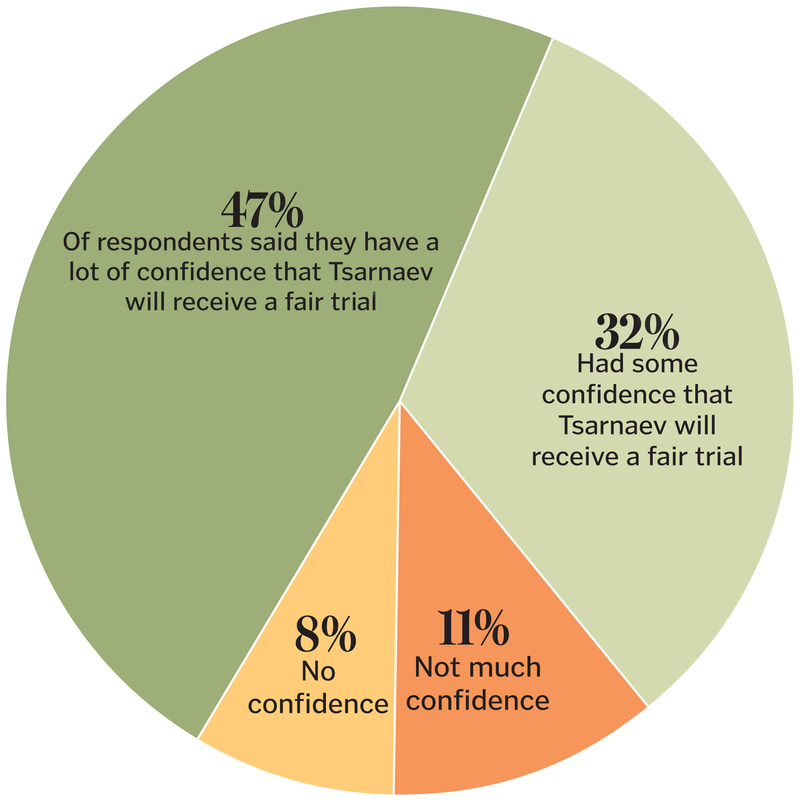 . .
Will Tsarnaev receive a fair trial? 79% had at least some confidence that he will. The public’s certainty that Tsarnaev can get a fair trial in Massachusetts is decidedly more mixed than that of presiding judge George A. O’Toole Jr., who has repeatedly denied requests for a change of venue. 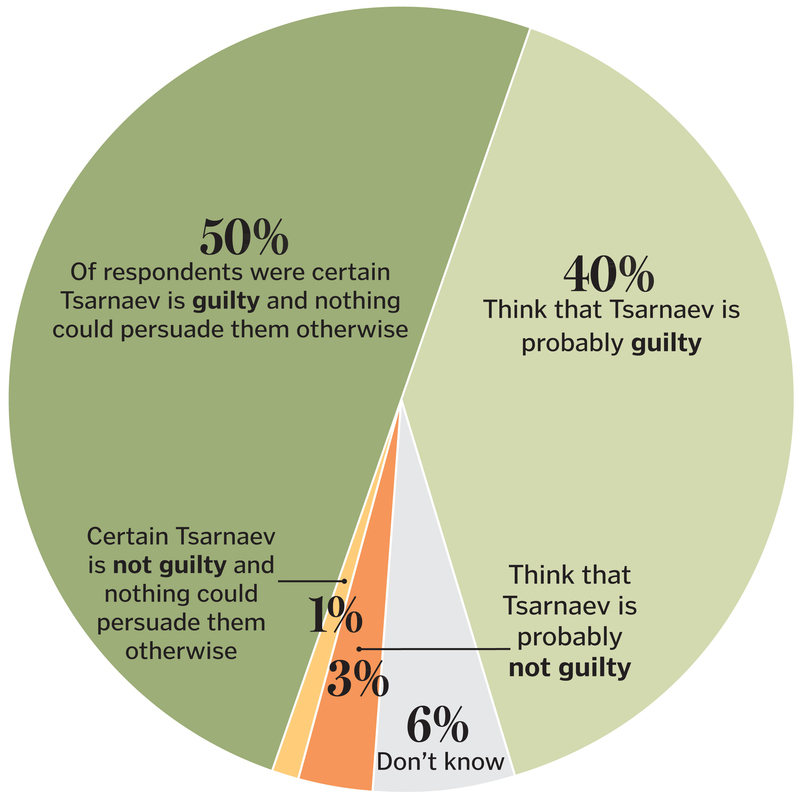 Contrast O’Toole’s stance to the fact that 90 percent of those polled said they are reasonably sure Tsarnaev is guilty — plus the nearly seven out of 10 juror questionnaires that also say as much — and that makes plenty of room for an appeal of any guilty verdict that comes down. 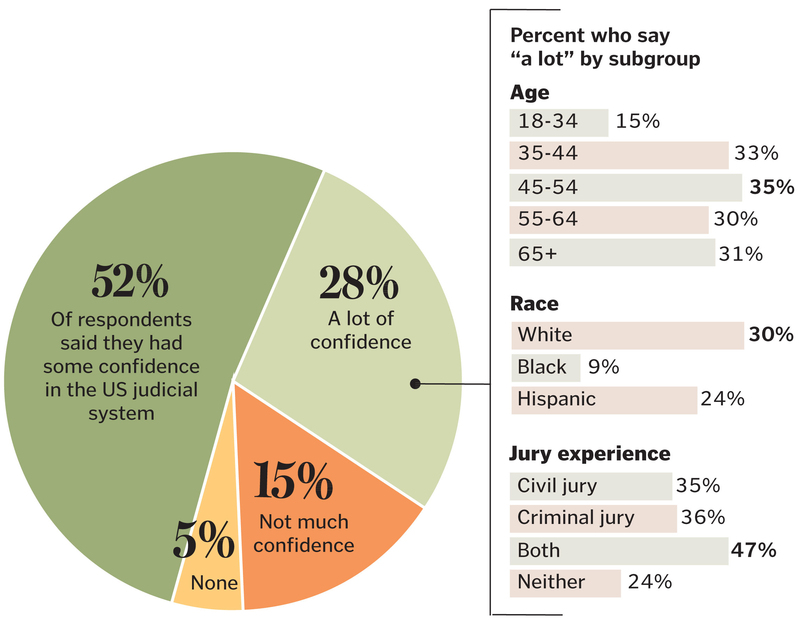 The portion of millennials highly confident in the US judicial system was half that of older generations. Jury service appears to inspire more trust. 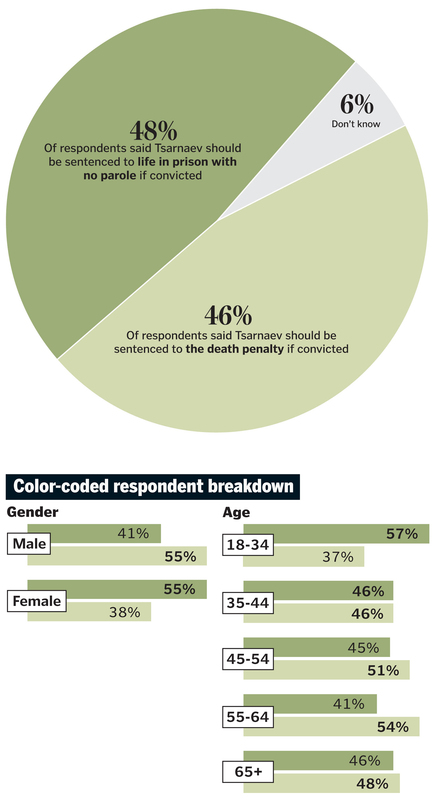 If convicted, what punishment should Tsarnaev face? 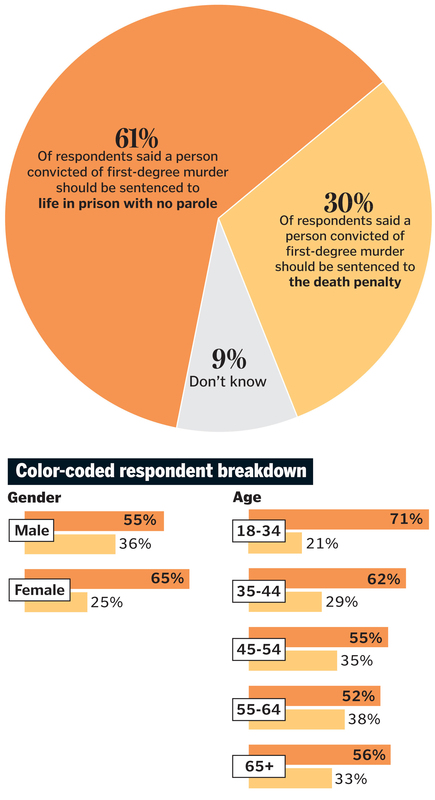 48% favor life in prison with no parole. Tsarnaev faces 30 counts associated with the Boston Marathon bombings, including the bombing of a public place, malicious destruction of public property, carjacking, disruption of commerce, and possession and use of a weapon of mass destruction resulting in death. What punishment does first-degree murder merit? Massachusetts abolished the death penalty in 1984, but federal prosecutors can still seek the death penalty, as is the case in this trial. Tsarnaev is the third person in the state to be charged under the federal death penalty. 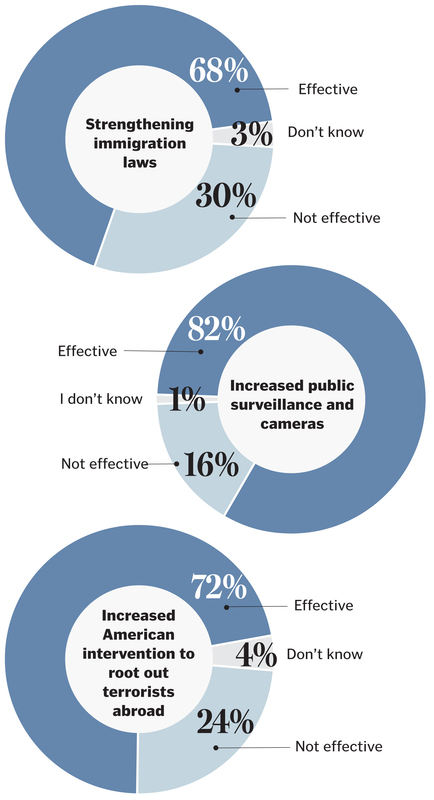 A deep fear of terrorism appears to be the basis for these inconsistencies: Nearly three in five respondents were willing to trade some personal freedom or privacy in the name of national security. This may be because the Marathon attacks took place so close to home — a nationwide poll done by CNN and Time Magazine two weeks after the 2013 bombings found 61 percent of Americans were more concerned about the government restricting civil liberties than the need for stricter law enforcement measures to prevent future attacks. Question: How effective do you think the following strategies can be at preventing terrorism in the future? It’s not hyperbole to suggest that Tsarnaev’s defense team is working as hard — if not harder — to keep him alive as get him acquitted. One obvious strategy is to seek sympathy for him because of his youth or by suggesting he only perpetrated this crime due to the influence of his older brother, Tamerlan. 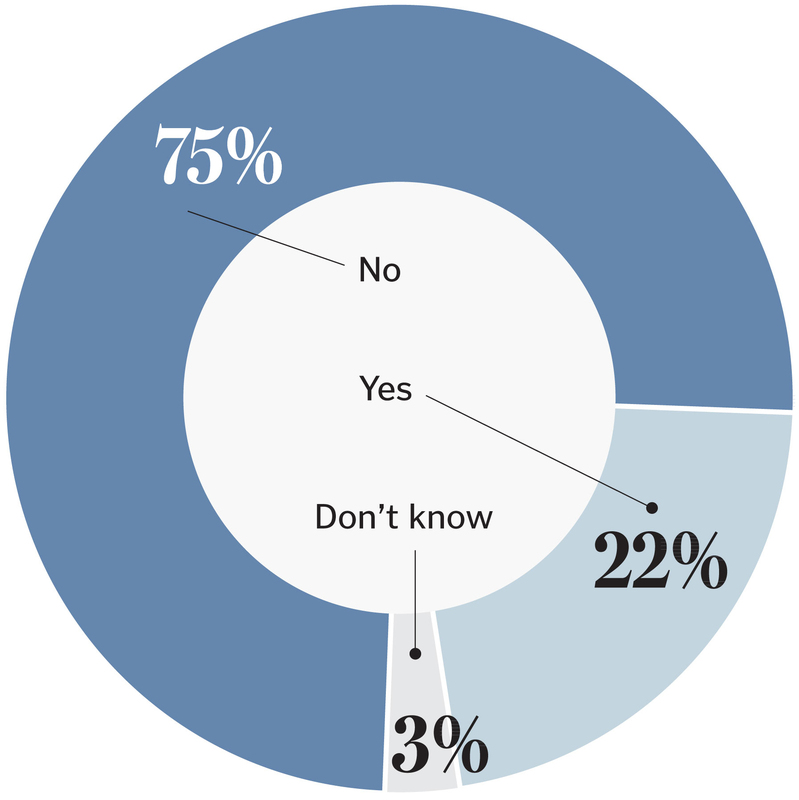 Neither of these arguments, however, held sway with our poll respondents. Tsarnaev was 19 years old at the time of the Boston Marathon bombings. Should his age be a consideration during sentencing? Some have suggested that Dzhokhar Tsarnaev may have been pressured by his older brother Tamerlan to commit the crimes associated with the Boston Marathon bombings. Should this be a consideration during his sentencing?